Beautiful certificate from the Boynton Bicycle Railway Company issued in 1891. This historic document was printed by Hosford & Sons Company and has an ornate border around it with a vignette and underprint of the Boynton Bicycle Railway. This item is hand signed by Eben Moody Boynton as President and Treasurer, and is over 119 years old. This train was built by Boynton and was supported by a wooden rail on top. 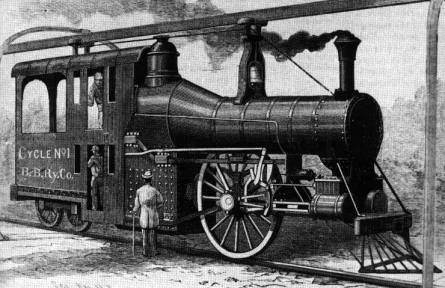 Boynton's idea was to adapt bicycle technology to railroading. Conventional trains required over a ton of equipment per passenger, and much of the energy that they expended was wasted due to factors such as wind resistance and side sway. But Boynton was convinced that a system incorporating a single rail on the ground, plus another on the top of the train for stability, would not only be more efficient, but could transport people at the then-unheard-of rate of over 60 miles per hour. Brimming with enthusiasm, he set up an experimental line approximately a mile long in the grasslands of Coney Island. His locomotive, which was dubbed "The Flying Billboard" by some critics, weighed a scant 4 tons, and pulled a series of double-decker passenger coaches only 4 feet wide. In test runs the train indeed hit sixty MPH, and could have conceivably gone much faster, had there been sufficient track for it to reach full velocity, and the ride was so smooth that the upper rail hardly seemed necessary. The public was impressed, although some doctors expressed the then-popular notion that such high rates of travel could be dangerous to passengers' health. Boynton began to propose rebuilding the city's elevated lines to accommodate his new technology, and spoke of inter-urban lines to Boston. Although Boynton's invention fascinated many scientists and engineers of his day, he was never able to garner enough backing to expand beyond his small demonstration line in Brooklyn. Railroad historians, however, believe that his major handicap was simply being born a century too soon. When the New York and Sea Beach Railroad leased the Brighton Beach Railway Company, it never ran trains on it. The line's condition was poor and the bridges it crossed were in questionable condition. However, the rails on the SB&B trestles were still in good condition and would be used to replace the NY&SB mainline rails that were in poor condition. Portions of the line between Gravesend Ave (today's McDonald Ave) and Brighton Beach became the experimental Boynton Bicycle Railroad, an early monorail. Today, Boynton Place commemorates both the Bicycle Railway and the SB&B right of way. 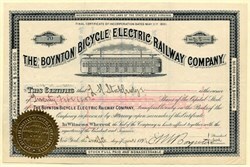 The Harvard University, Graduate School of Business Administration, Baker Library, Manuscripts and Archives Department contains Dates of a collection from 1908-13 of the BOYNTON BICYCLE ELECTRIC RAILWAY COMPANY, Boston, MA. Included in this collection are letters to and from E. Moody Boynton, patents, and a map.